What is Berkeley's proposed cell phone Right To Know ordinance? Posted in General Health & Wellness on July 30, 2015. Last modified on April 23, 2019. Read disclaimer. To date, most studies have failed to establish a link between cell phone use and brain tumors or any other health condition. On the other hand, we don't know with certainty that long term use of cell phones is absolutely safe. (For one thing, as cell phones get smarter, such as moving up from 3G to 4G, the amount of radiation they produce increases.) The Berkeley City Council's concern, however, is that most of us	are	not	carrying our phones in the way that FCC guidelines specify when phones are safety tested. As FCC regulations currently stand, cell phone manufacturers must meet federal "Specific Absorption Rates" (SAR) which assume that the user will carry their phone about a half inch (10-15mm) from their body, such as in a holster or belt clip. And, while this may have been common when cell phones were first introduced, most of us now carry our phones in a pocket, waistband, bra or somewhere that is more tight against our body. The city of Berkeley believes that citizens may change their behavior if they are better informed. If these are the manufacturer's own safety recommendations, what is the cell phone industry's opposition to the ordinance? CTIA (Cellular Telephone Industries Association) believes that the current guidelines are overly conservative to start with and that "when a cell phone is certified as compliant with the FCC’s guidelines, that phone is safe, however it is worn, even if a particular usage results in exposure 'well above' the limit." CTIA feels that Berkeley's message is misleading and could result in a cumbersome patchwork of regulations springing up across the country. How is Berkeley's ordinance different than San Francisco's cell phone safety ordinance which was implemented in 2010 but stopped shortly after? 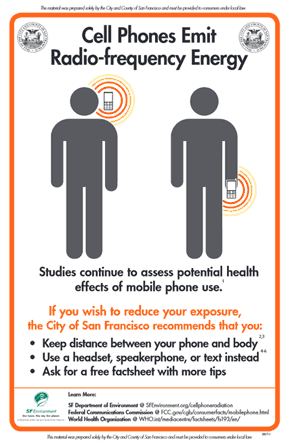 San Francisco's Right to Know ordinance went quite a bit further in its warnings of the possible health effects of cell phone radiation. It also focused on additional steps a person can take to minimize exposure. In 2012, courts ruled that there is not enough scientific proof showing that cell phone radiation is dangerous, that phones that comply with FCC guidelines are safe and that San Francisco must cease its ordinance. Exercise caution when it comes to children using cell phones, since kids have thinner skulls and will probably be using cell phones much longer. Use the speakerphone when not in public. 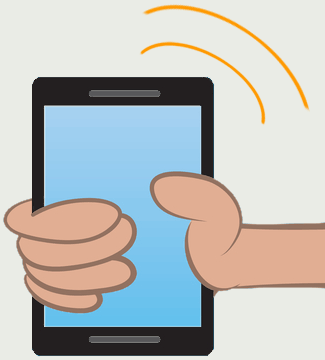 Radiation exposure drops with every inch that you hold the phone farther from your body. If you use a Bluetooth headset -- use it only as needed and switch it from ear to ear to minimize radiation exposure on either side. While Bluetooth headsets reduce radiation exposure, they don't completely eliminate it. To keep the phone farther away from your body, text more and talk less. Don't carry your phone in your shirt or pants' pocket or bra or sleep with it under the pillow. Instead, keep it at least a small distance away from your body such as on the desk, in a holster, belt clip, backpack or handbag since body tissues close to the waist, such as liver and kidneys may absorb radiation even more efficiently than the brain. Be aware that radiation levels increase when the phone has a weak connection or is searching for a cellular tower (such as when you're in an elevator, traveling or located in rural areas). Cut back on the amount of time spent on your cell phone and turn it off when you won't be using it. Radiation it is everywhere around us in the air, water, soil and all living organisms. So, it's important to recognize that all types of radiation don't carry the same potential to harm us. Ionizing radiation (on the shorter wave length and higher frequency or higher energy end of the spectrum) is what's produced by nuclear weapons, x-rays and even UV light. It carries enough energy to knock electrons off cells, damage DNA and, if we are exposed to too much of it, can result in cancers or even death. Radio waves (such as what we are exposed to from airport body scanners, microwave ovens, and television, cell phone and radio signals), on the other hand, have the longest wave lengths and lowest frequencies and are non-ionizing radiation. While radio waves have enough energy to vibrate atoms and can produce heat, they do not carry enough energy to disrupt electrons - especially at the levels emitted and received by cell phones. So while your phone may heat up a little during use, I think most scientists agree that there is no known way that it could harm you, much less cause cancer. Thank you for your insightful post, Francis. So, it may still be prudent to practice a reasonable amount of caution. I wonder about the possible concerns about tablets/ipads? Do they emit more or less radiation? That is a very good question, Angie. According to "Responding to Wi-Fi Safety Concerns in Our Schools" by the Washington State Dept. of Health (2014), Wi-Fi equipment (such as many tablets and laptops) exposes users to much less RF (radio frequency energy) radiation than is emitted by cell phones, and are not believed to be a cause for concern. On the other hand, I've noticed that Apple includes an "Exposure to Radio Frequency Energy" section in their iPad Important Product Information Guide. It says, "to be sure that human exposure to RF energy does not exceed the FCC, IC, and European Union guidelines, always follow these instructions and precautions: Orient the device in portrait mode with the Home button at the bottom of the display, or in landscape mode with the cellular antenna (located under the black edge at the top of the device) away from your body or other object." Apple goes on to mention that "In general, the closer you are to a cellular base station, the lower the cellular transmitting power level" and "If you are still concerned about exposure to RF energy, you can further limit your exposure by limiting the amount of time using iPad Wi-Fi + 3G in wireless mode, since time is a factor in how much exposure a person receives, and by placing more distance between your body and iPad Wi-Fi + 3G, since exposure level drops off dramatically with distance." So, while I am certainly no expert, but it appears that connecting to the internet via Wi-Fi may expose us to less RF radiation than if we connect via a cellular connection. In fact, I found this quote in The Guardian: "It has been estimated that you get a bigger dose of microwaves from one 20-minute phone call than from a year's Wi-Fi." A) sit and sleep at least 3 feet away from your router and set your tablet or laptop on a table or tray rather than on your lap. B) turn off your router and connect via Cat5 cable (though you may still be exposed to Wi-Fi from your neighbor's house or apartment.